Home > Water Guide > Guide: Water & Health > What is Water? Water, water everywhere… the familiar lament of the Ancient Mariner is more true than most people really understand. Water really is just about everywhere. In its purest form, water consists of two elements – hydrogen and oxygen, two parts hydrogen to one part oxygen. But water is nearly impossible to find in its purest form. Comet LINEAR has shown us that Earth's oceans could hail from comets after all. But do they? Comets aren't the only candidate water sources for Earth. Our oceans may have been delivered by asteroids (another controversial idea) or perhaps water was caught up in the body of Earth as it formed and later released by volcanic outgassing (as many of us learned in school). Or all of the above! In other words, no one is really sure. There are a lot of theories, but none of them are proven. We do know that water is not ever lost or destroyed. It is used, reclaimed and reused in a natural cycle that has been going on for millions upon millions of years. The cycle is known as the Water Cycle – or for those that like their terms fancy, “hydrologic cycle”. If you studied fifth grade science, you’ve probably heard of it, and most people have at least an elementary idea of how it works. The Hydrologic Cycle. Click image to enlarge. 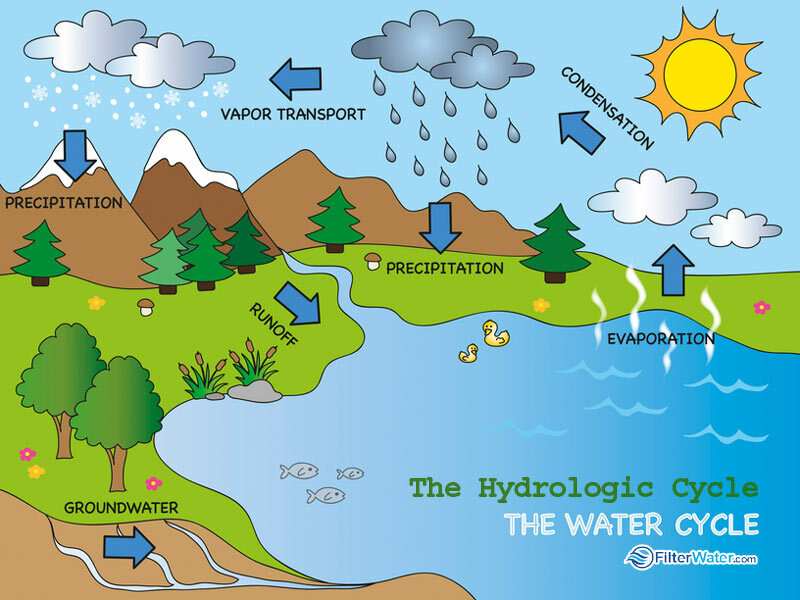 The hydrologic cycle is the never-ending journey that water makes as it circulates from the atmosphere, through the land and sea and plants and back into the sky. The energy from the sun’s heat evaporates the Earth’s surface water from oceans, lakes, rivers and streams. Plants return moisture to the air through a process called transpiration. All this moisture – water vapor – condenses in the air and forms clouds. The clouds become laden with water, and as they rise, the water vapor condenses further. Eventually, the water becomes too heavy to remain in the air, and it falls back to Earth as precipitation in the form of rain, snow, sleet or hail. The precipitation falls on the sea, where the evaporation process begins again, or onto the land. Some of the water that falls on land will soak into the ground where it is trapped by soil and layers of rock, or is absorbed by plants – beginning the transpiration process again. Most of it, though, will become runoff, flowing downhill until it eventually becomes part of the sea and the cycle starts all over again. Because water dissolves nearly everything that it touches, as it makes its way through the hydrologic cycle, it picks up elements and minerals from the Earth, the plants and the sky. These elements are what give water its ‘flavor’ – but they also can make water unsafe for drinking. Water quality is judged by how contaminated a water source is with minerals and other elements. The Environmental Protection Agency publishes water quality indexes that regulate the amount of various trace elements that are allowed in the public drinking water supply. These indexes are used to judge whether water is safe to drink or use for bathing and cooking.